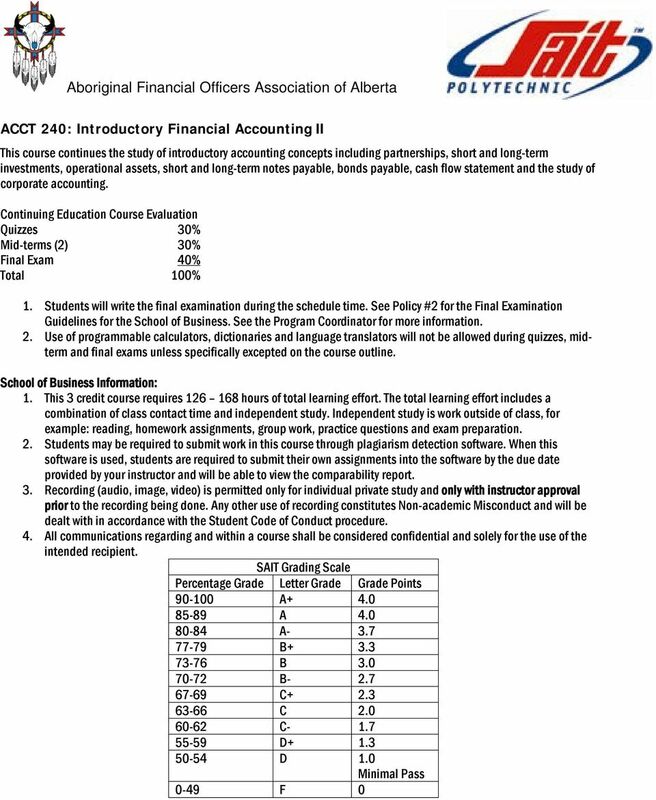 Download "Introductory Financial Accounting Course Outline"
3 Student Code of Conduct Academic dishonesty is considered to be an extremely serious academic offence. Reference: Procedure AC Student Code of Conduct (Available on Ownership of Student Produced Work According to Policy AC.3.10, SAIT will normally return students work to the students. However, in certain courses, SAIT retains the right to keep physical possession of the students work. Your instructor will discuss this with you at the start of the course. Reference: Procedure AC.3.10 Ownership of Student Produced Work (available on Course Text(s): Provided on first day of class and included in registration fee. Larson, K.D. & Jenson, T. (2013). Fundamental Accounting Principles, Volume 1 (14 th Canadian ed.). McGraw- Hill Ryerson. Other: Please refer to the learning management system (LMS) to access resources for this course. Materials: Required calculator Texas Instruments BAII Plus Provided at first session and included in registration fee. 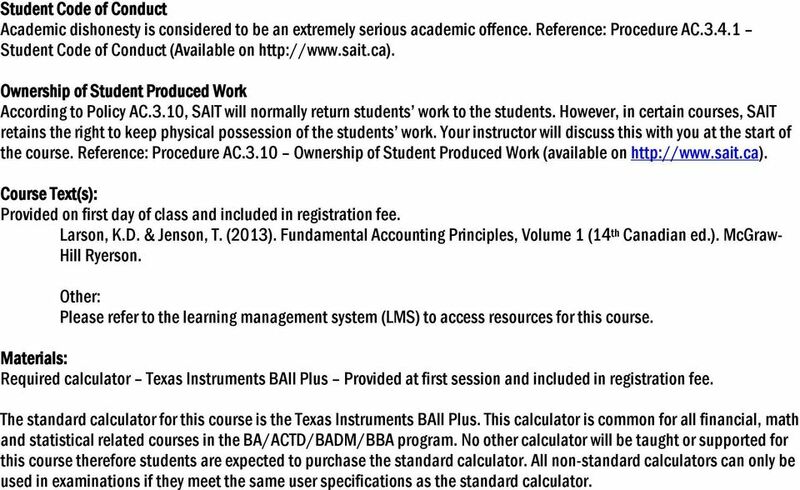 The standard calculator for this course is the Texas Instruments BAII Plus. This calculator is common for all financial, math and statistical related courses in the BA/ACTD/BADM/BBA program. No other calculator will be taught or supported for this course therefore students are expected to purchase the standard calculator. All non-standard calculators can only be used in examinations if they meet the same user specifications as the standard calculator. 4 COURSE CONTENT Below is presented a list of the learning modules used to achieve the learning outcomes(s) for this course. 1. An Introduction to Business, Accounting and Ethics Define the function of accounting using the accounting equation and changes to the component parts. 1.1 Describe the function of accounting and the nature and purpose of the information it provides. 1.2 List the main fields of accounting and the activities carried on each field. 1.3 Describe the importance of ethics in accounting. 1.4 List the basic steps in the accounting cycle. 1.5 Identify and describe the elements of the accounting equation. 1.6 Analyze the effects of transactions on the elements of the accounting equation. 1.7 Prepare simple financial statements. 1.8 Explain the accounting principles; business entity principle, objectivity principle, cost principle, goingconcern principle, revenue recognition principle. 1.9 Explain the differences between a single proprietorship, a partnership and a corporation. 2. Recording Transactions Record business transactions. 2.1 Describe the nature of the events that are recorded in accounting. 2.2 Describe the use of accounts to record and store the effects of business transactions and the use of a number to identify each account. 2.3 Define debit and credit in relation to T-accounts. 2.4 State the rules of debit and credit and analyze transactions. 2.5 Record transactions in a General Journal, use balance column accounts, and post entries from the journal to the accounts. 2.6 Prepare a trial balance. 3. Adjusting Accounts and Preparing Statements Prepare financial statements. 3.1 Explain why the life of a business is divided into accounting periods of equal length. 3.2 Explain why adjustments are required by the revenue recognition and matching principles. 3.3 Differentiate between accrual basis of accounting and cash basis. 3.4 Prepare adjusting entries. 3.5 Prepare financial statements from the adjusted trail balance. 3.6 Prepare entries to record cash receipts and cash disbursements related to accrued assets and liabilities that were recorded at the end of the previous accounting period. 3.7 Prepare a classified balance sheet. 3.8 Calculate the current ratio. 5 3.9 Calculate a company s debt ratio Explain the role and composition of the different components of an annual report, including MD+A, Auditor s Report, Management Letter, Financial Statements and notes. 4. Completion of the Accounting Cycle Use the worksheet as a tool to facilitate financial reporting. 4.1 Explain why it is necessary to close the temporary accounts at the end of each accounting period. 4.2 Prepare closing entries. 4.3 Prepare a post-closing trail balance and explain its purpose. 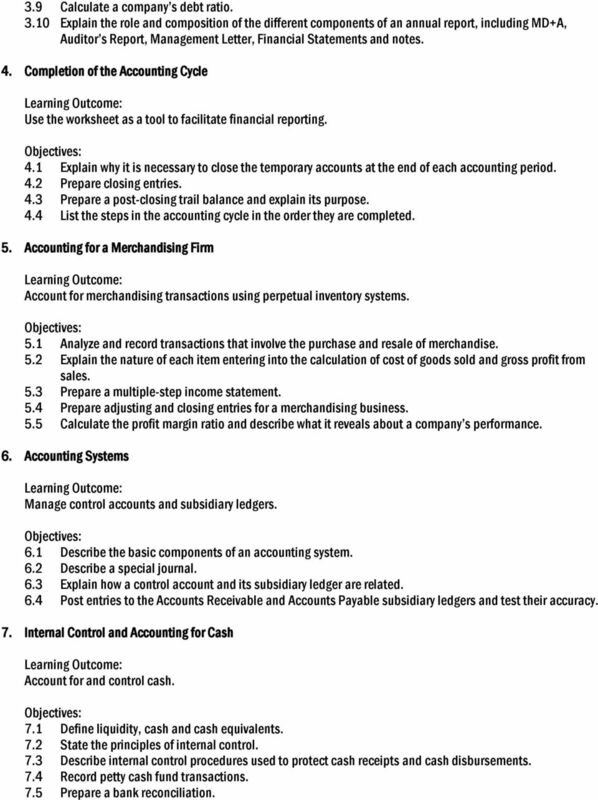 4.4 List the steps in the accounting cycle in the order they are completed. 5. Accounting for a Merchandising Firm Account for merchandising transactions using perpetual inventory systems. 5.1 Analyze and record transactions that involve the purchase and resale of merchandise. 5.2 Explain the nature of each item entering into the calculation of cost of goods sold and gross profit from sales. 5.3 Prepare a multiple-step income statement. 5.4 Prepare adjusting and closing entries for a merchandising business. 5.5 Calculate the profit margin ratio and describe what it reveals about a company s performance. 6. Accounting Systems Manage control accounts and subsidiary ledgers. 6.1 Describe the basic components of an accounting system. 6.2 Describe a special journal. 6.3 Explain how a control account and its subsidiary ledger are related. 6.4 Post entries to the Accounts Receivable and Accounts Payable subsidiary ledgers and test their accuracy. 7. Internal Control and Accounting for Cash Account for and control cash. 7.1 Define liquidity, cash and cash equivalents. 7.2 State the principles of internal control. 7.3 Describe internal control procedures used to protect cash receipts and cash disbursements. 7.4 Record petty cash fund transactions. 7.5 Prepare a bank reconciliation. 6 7.6 Calculate day s sales uncollected and describe it impact on cash management. 7.7 Calculate the acid-test ratio and describe what it reveals about a company s liquidity. 7.8 Assess the impact of financial results on operations. 7.9 Apply horizontal and vertical analysis. 8. Receivables Account for receivables. 8.1 Record credit card and debit card sakes. 8.2 Account for uncollectible accounts, using the allowance and direct write-off methods. 8.3 Calculate simple interest on promissory notes. 8.4 Record the receipt, payment and dishonor of promissory notes. 8.5 Calculate accounts receivable turnover. 9. Inventories and Cost of Goods Account for inventory and cost of goods sold. 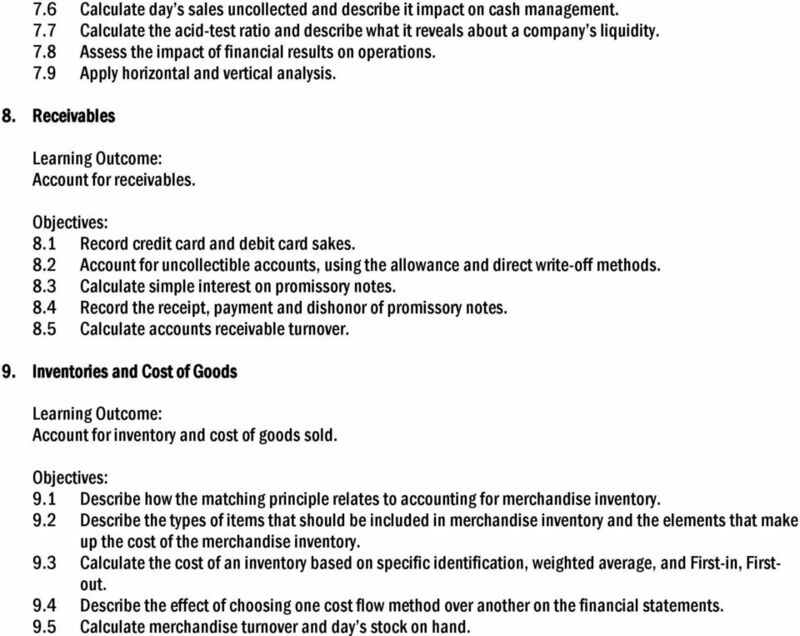 9.1 Describe how the matching principle relates to accounting for merchandise inventory. 9.2 Describe the types of items that should be included in merchandise inventory and the elements that make up the cost of the merchandise inventory. 9.3 Calculate the cost of an inventory based on specific identification, weighted average, and First-in, Firstout. 9.4 Describe the effect of choosing one cost flow method over another on the financial statements. 9.5 Calculate merchandise turnover and day s stock on hand. 8 Attendance: Effort and involvement are as essential for learning as they are for success in your career. To help assure your success, participation in all activities of this course is expected. Your program will identify any specific requirements applicable to this class and delivery method. Reference: Procedure AC Attendance Requirements (available on Student Code of Conduct Academic dishonesty is considered to be an extremely serious academic offence. Reference: Procedure AC Student Code of Conduct (Available on Ownership of Student Produced Work According to Policy AC.3.10, SAIT will normally return students work to the students. 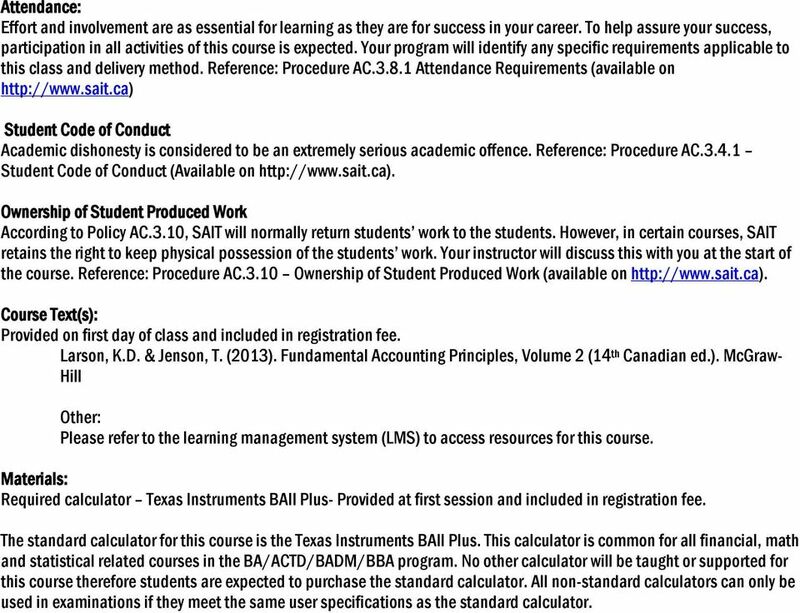 However, in certain courses, SAIT retains the right to keep physical possession of the students work. Your instructor will discuss this with you at the start of the course. Reference: Procedure AC.3.10 Ownership of Student Produced Work (available on Course Text(s): Provided on first day of class and included in registration fee. Larson, K.D. & Jenson, T. (2013). Fundamental Accounting Principles, Volume 2 (14 th Canadian ed.). McGraw- Hill Other: Please refer to the learning management system (LMS) to access resources for this course. Materials: Required calculator Texas Instruments BAII Plus- Provided at first session and included in registration fee. The standard calculator for this course is the Texas Instruments BAII Plus. This calculator is common for all financial, math and statistical related courses in the BA/ACTD/BADM/BBA program. No other calculator will be taught or supported for this course therefore students are expected to purchase the standard calculator. All non-standard calculators can only be used in examinations if they meet the same user specifications as the standard calculator. 9 COURSE CONTENT Below is presented a list of the learning modules used to achieve the learning outcomes(s) for this course. 1. Generally Accepted Accounting Principles Apply the conceptual framework for financial reporting. 1.1 Identify the qualitative characteristics of accounting information. 1.2 Define the basic elements of financial statements. 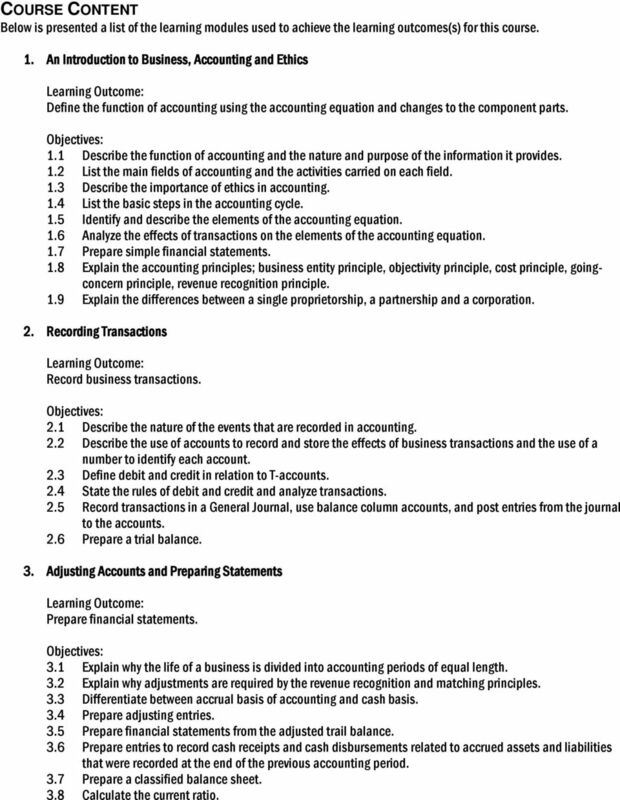 1.3 Explain the basic assumptions of accounting. 1.4 Explain the basic principles of accounting. 1.5 Explain the constraints in accounting. 2. Capital Assets Record the purchase and depreciation of capital assets. 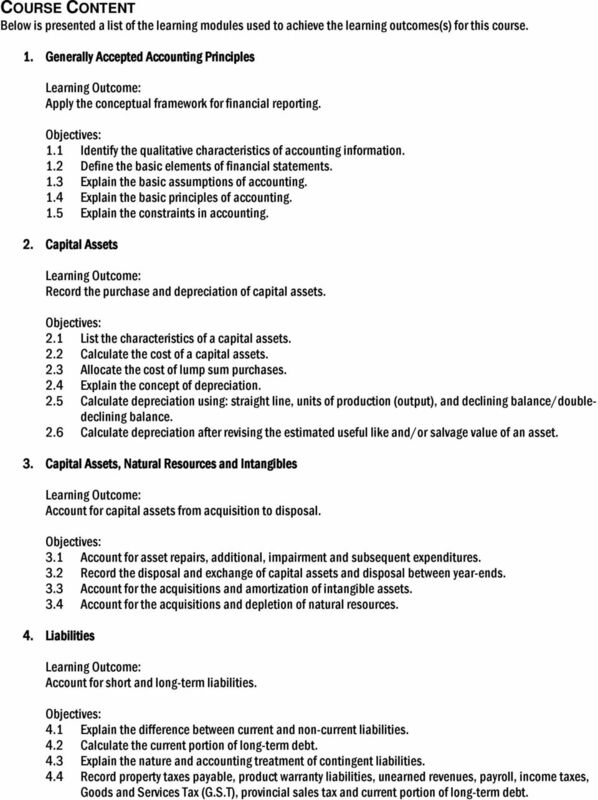 2.1 List the characteristics of a capital assets. 2.2 Calculate the cost of a capital assets. 2.3 Allocate the cost of lump sum purchases. 2.4 Explain the concept of depreciation. 2.5 Calculate depreciation using: straight line, units of production (output), and declining balance/doubledeclining balance. 2.6 Calculate depreciation after revising the estimated useful like and/or salvage value of an asset. 3. Capital Assets, Natural Resources and Intangibles Account for capital assets from acquisition to disposal. 3.1 Account for asset repairs, additional, impairment and subsequent expenditures. 3.2 Record the disposal and exchange of capital assets and disposal between year-ends. 3.3 Account for the acquisitions and amortization of intangible assets. 3.4 Account for the acquisitions and depletion of natural resources. 4. Liabilities Account for short and long-term liabilities. 4.1 Explain the difference between current and non-current liabilities. 4.2 Calculate the current portion of long-term debt. 4.3 Explain the nature and accounting treatment of contingent liabilities. 4.4 Record property taxes payable, product warranty liabilities, unearned revenues, payroll, income taxes, Goods and Services Tax (G.S.T), provincial sales tax and current portion of long-term debt. 10 4.5 Account for short-term and long-term notes payable. 4.6 Calculate the payments on short-term and long-term notes payable. 5. Partnerships Account for partnerships. 5.1 Explain the characteristics of a partnership including mutual agency and unlimited liability, limited life, property ownership, tax statues, advantages and disadvantages. 5.2 Describe the equity structure and accounts for a partnerships. 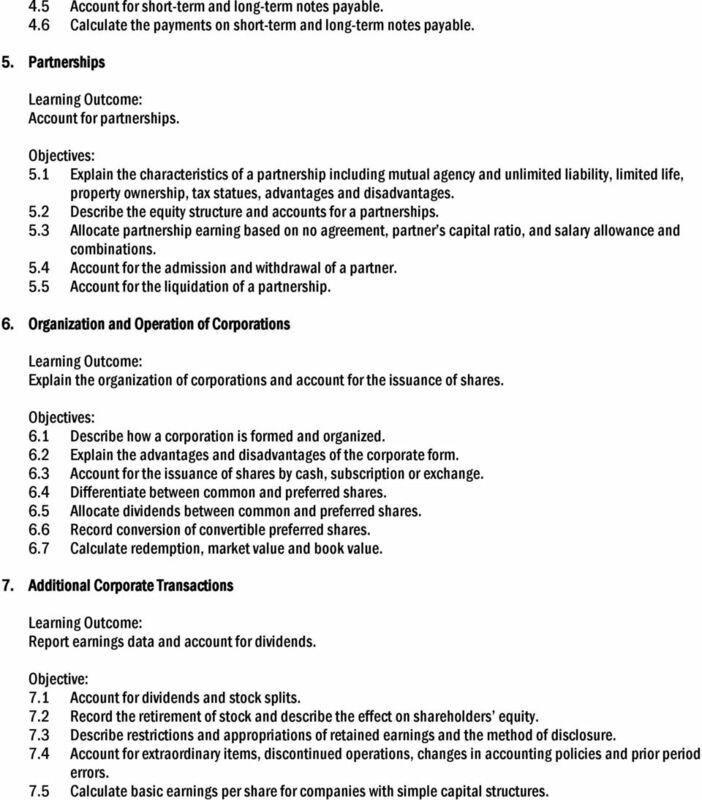 5.3 Allocate partnership earning based on no agreement, partner s capital ratio, and salary allowance and combinations. 5.4 Account for the admission and withdrawal of a partner. 5.5 Account for the liquidation of a partnership. 6. Organization and Operation of Corporations Explain the organization of corporations and account for the issuance of shares. 6.1 Describe how a corporation is formed and organized. 6.2 Explain the advantages and disadvantages of the corporate form. 6.3 Account for the issuance of shares by cash, subscription or exchange. 6.4 Differentiate between common and preferred shares. 6.5 Allocate dividends between common and preferred shares. 6.6 Record conversion of convertible preferred shares. 6.7 Calculate redemption, market value and book value. 7. Additional Corporate Transactions Report earnings data and account for dividends. Objective: 7.1 Account for dividends and stock splits. 7.2 Record the retirement of stock and describe the effect on shareholders equity. 7.3 Describe restrictions and appropriations of retained earnings and the method of disclosure. 7.4 Account for extraordinary items, discontinued operations, changes in accounting policies and prior period errors. 7.5 Calculate basic earnings per share for companies with simple capital structures. 11 8. Long-term Liabilities Account for notes and bonds payable. Objective: 8.1 Describe the characteristics of bonds. 8.2 Calculate the price of a bond on an interest payment date and between interest dates. 8.3 Record interest payments for a bond sold at a discount or premium using the effective interest method. 8.4 Account for bonds sold between interest dates. 8.5 Account for the retirement of bonds. 8.6 Prepare year-end adjusting entries for bonds. 9. 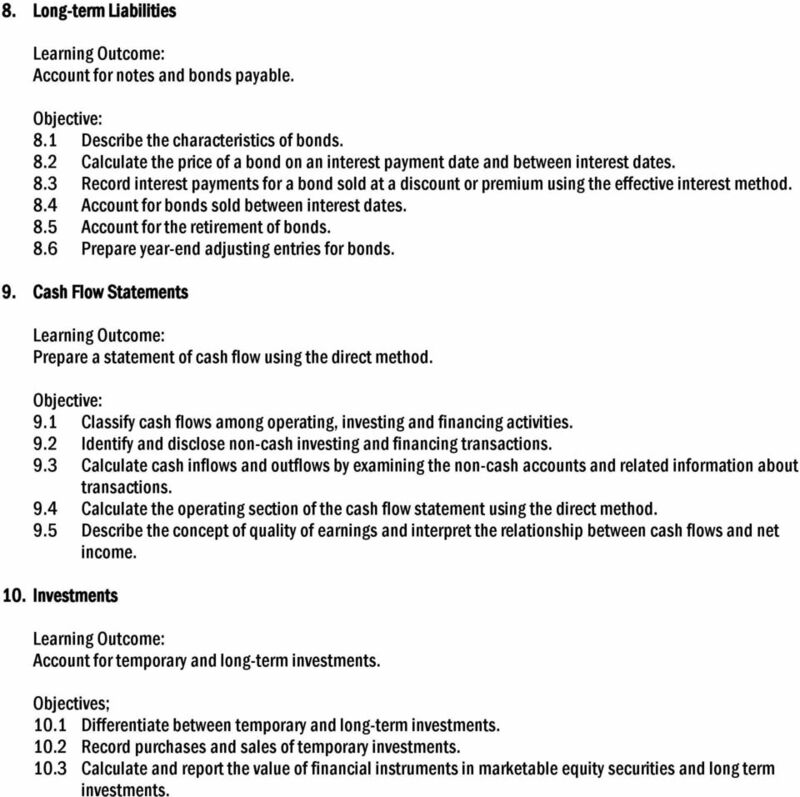 Cash Flow Statements Prepare a statement of cash flow using the direct method. Objective: 9.1 Classify cash flows among operating, investing and financing activities. 9.2 Identify and disclose non-cash investing and financing transactions. 9.3 Calculate cash inflows and outflows by examining the non-cash accounts and related information about transactions. 9.4 Calculate the operating section of the cash flow statement using the direct method. 9.5 Describe the concept of quality of earnings and interpret the relationship between cash flows and net income. 10. Investments Account for temporary and long-term investments. Objectives; 10.1 Differentiate between temporary and long-term investments Record purchases and sales of temporary investments Calculate and report the value of financial instruments in marketable equity securities and long term investments. Prerequisite: No specialized equipment or facilities. 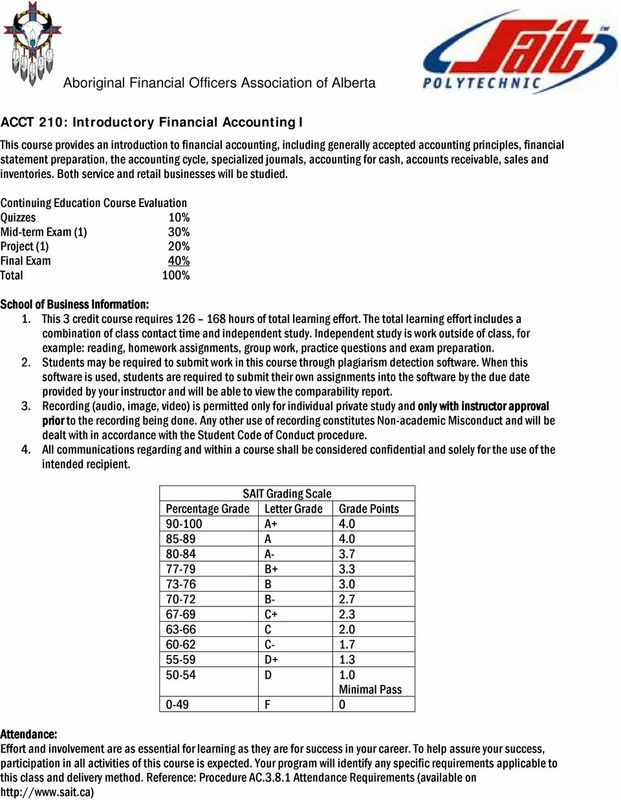 ECON 3A- INTRO ACCOUNTING, SPRING 2005 MIDTERM #1 Name: Perm #: Date: ID: A S05 MT1 True/False Indicate whether the sentence or statement is true or false- MARK ON YOUR SCANTRON- A FOR TRUE AND B FOR FALSE.